Below are effective home remedies for stomach pain in kids to help your child feel better without the need of over the counter medication. Stomach pain can be very hard to diagnose as a parent in young children at home. There are many causes of stomach pain and different symptoms that shows how serious your child’s condition is. It is recommended that if your child’s symptoms are accompanied by a high fever, nausea, vomiting, bloody stool, last more than 3 days, or a pain that is in the lower right side of the stomach, you should see a doctor right away. Below are 7 natural remedies to help your child recover fast from his or her tummy ache! Children recover faster than adults, therefore, you should see some changes quickly when applying some of the following remedies. One of the best ways to get your child to consume liquids is by offering different varieties of them. Liquids come in different forms like orange juice, apple juice, ginger ale, or 7up which toddlers and kids love drinking. The clearer the liquid, the better so try to get them to drink enough warm water every hour or so. Keeping your child hydrated will help remove toxins, gas, and infections from his/her body. Another fast and safe remedy for relieving stomach pain in kids is by using warm compresses. A warm compress will provide almost instant relief from pain and generate a soothing effect quickly. Simply fill a bottle with hot water and wrap a towel around it. Place it over your child’s stomach for at least 20-30 minutes. Change the water if you feel it change temperature during the compress. Yogurt is a natural probiotic which known to replace good bacteria in the gut. Studies show that probiotic foods help sooth the stomach lining and reduce stomach pain fast. soothing the stomach pain. To make this remedy more effective, mix a teaspoon of ground fenugreek seeds in the yogurt before feeding it slowly to your child. Herbs like mint and ginger along with lemon juice in a cup of boiled water create a soothing effect on the stomach. Mint is known to help remove bacteria from the gut but this remedy should not be given to children under 2 years of age. Massaging your child’s stomach using a circular motion can help relieve stomach pain very fast. Warm some olive oil and pour a little into your palms, now apply it to your child’s stomach around the naval area and begin massaging gently in a circular motion for at least 10 minutes. There is nothing more healing than a little nap. By making your child take time out and rest during the day, he/she might feel better quickly without the need for remedies or medications. Make sure that your child wears loose fitting clothes during nap time for best results. Trapped gas can be easily reduced by taking a little walk. Studies show that 87% of people who suffer from trapped gas, bloating or indigestion quickly found relief from a simple daily 30-minute walk. Have your child get some outdoor activities while experiencing stomach pains and see if there are any changes. There you have It! 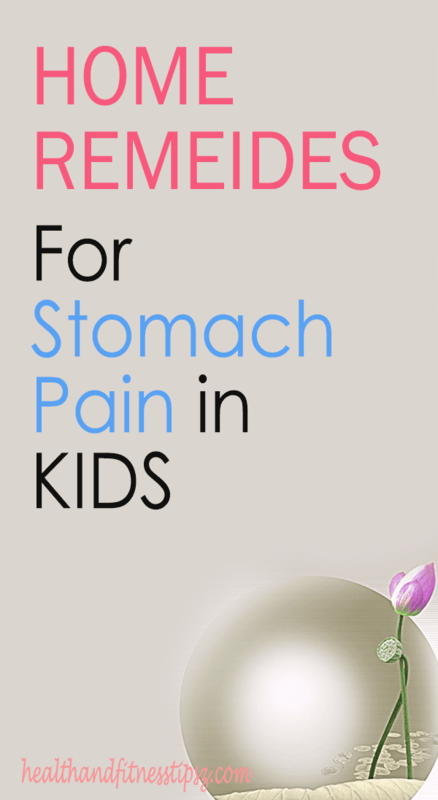 7 effective home remedies for stomach pain in kids to help your child recover fast.